SPISim_LINK: A free web app for validating SPISim’s AMI models w/ link analysis. SPISim_LINK is a browser based web app. It allows user to configure channel using IBIS, interconnect, Tx/Rx AMI models and perform link analysis. Both statistical and bit-by-bit modes are supported. SPISim_LINK is designed for user to experiment/validate SPISim's AMI models. It's not intended to serve as a generalized channel simulator such as KeySight's ADS and/or Synopsys's HSpice. User's own AMI models are not supported here. StatEye type analysis is different from traditional nodal-based spice analysis. It has specific model requirements (such as using IBIS-AMI models) and some assumptions (such as passive LTI channel, high-Z between Tx/Rx and analog front end) in order to simulate statistically or doing bit-by-bit for millions of bits. These are necessary in order to obtain accurate BER down to say 1E-12 or even smaller. While IBIS-AMI is a mature modeling format for SERDES or HSIO interfaces, it requires many cross-domain disciplines and much engineering efforts to generate models. EDA tools supporting StatEye analysis do exist yet they cost typically more than 6-figure. So users intended to perform such StatEye analysis will face hurdles on both sides: no AMI models and no simulators! For discussion of these topics, please see our various blog posts. With thoughtful and careful architecture, SPISim_LINK is developed to bridge the gap! We have quick settings for all Tx/Rx/Channel stages for you to assemble a channel quickly and run StatEye analysis right here right now without charge. Want AMI models? Our AMI models are pre-built, pre-test and configurable by you both in terms of assembling stages and model parameters. AMI models can now be generated and tested without up-front cost or EDA vendors locked in. This tool will never expire. It patches itself and run directly from the browser. While some limitations do exist, you can always unlock at a very low price!. Want to license this tool on your website to use your company's IC's AMI models only? No problem! See "Unlock" tab or contact us for details. For SPISim_LINK's usage, please refer to its user's manual. To minimize the app's download size, only Windows 64 AMI library is included. It does NOT support user's own AMI models. Use a SPISim's pass-through at Tx/Rx if necessary. For bit-by-bit modes, it will run up to 5000 bits at most. Upon its formal release, at least one of Tx or Rx side must use SPISim's AMI model. There is no such restriction while it's in beta. AMI model generated can be unlocked on a per part basis for USD. 3000.00. Company wide enabling is also available thorough licensing or Modeling Suite purchase. The back-end stat-eye simulator supports batch mode flow as well. Along with this web app, it can be licensed to meet your model release/internal analysis needs. This function, along with other IBIS modeling and tuning flow, is also available in the SPIPro. Tx/Rx AMI model: Our simulator should handle AMI models generate via either "Quick Settings" or "SPISim's Spec. AMI" model just fine. When user's own AMI models are used, it is possible that the compatibility will become an issue. In such case, please provide the .ami file at least so that we can validate with our AMI parameter parser. Channel model: When channel's response waveform is provided in .csv format, it should have header at first row and at least two columns. The first column should be time points and the second column is waveform. If simulator is specified, user should have the requirement such as installation or license set-up ready first. SPISim_LINK does NOT come with any spice subckt simulator built-in. Number of bits to simulate: the free version limits number of bits to run in Bit-by-Bit mode to be 4000 at most. Time and memory required to simulate more bits are subject to each computer's performance. When support is needed, please export the settings to a .cfg file, then submit this file alone with related models, such as user generated SPISim Spec. AMI model or user's own AMI models, to SPISim support. SPISim_LINK is designed for user to experiment/validate SPISim’s AMI model in a channel configuration. User’s own AMI models are not supported in this web app. 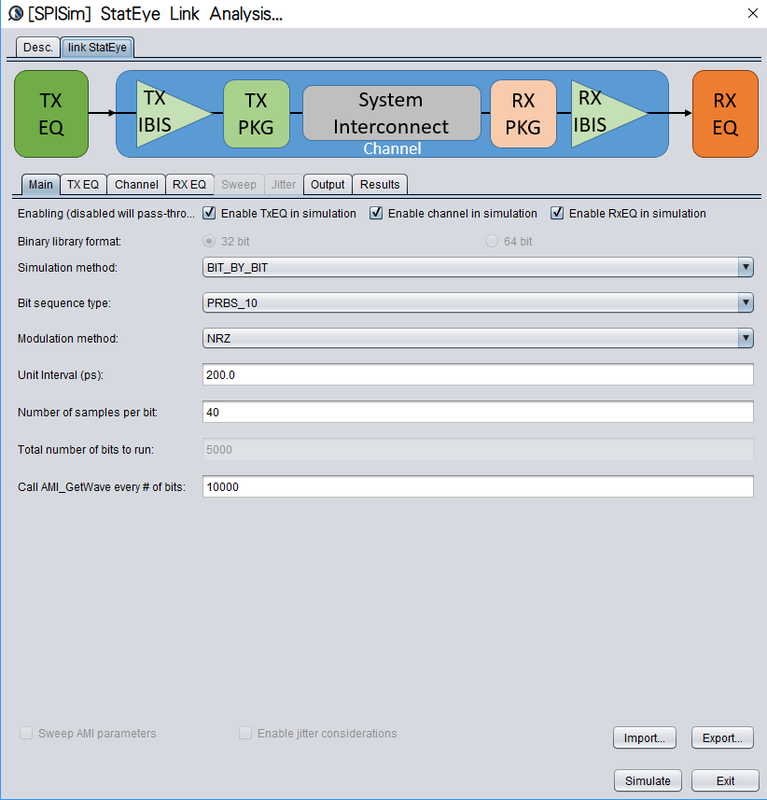 SPISim_LINK is not intended to replace a generalized channel simulator such as ADS’s Channel Simulator from KeySight or HSpice from Synopsys. Unlocked or not, the above two statements stand true. Please see “Unlock” tab above for further details about this web-app.